*For specific branch offerings, times, dates, and pricing please contact your Welcome Center. PLEASE NOTE: The YMCA of Metro North has transitioned to a new swim levels program. 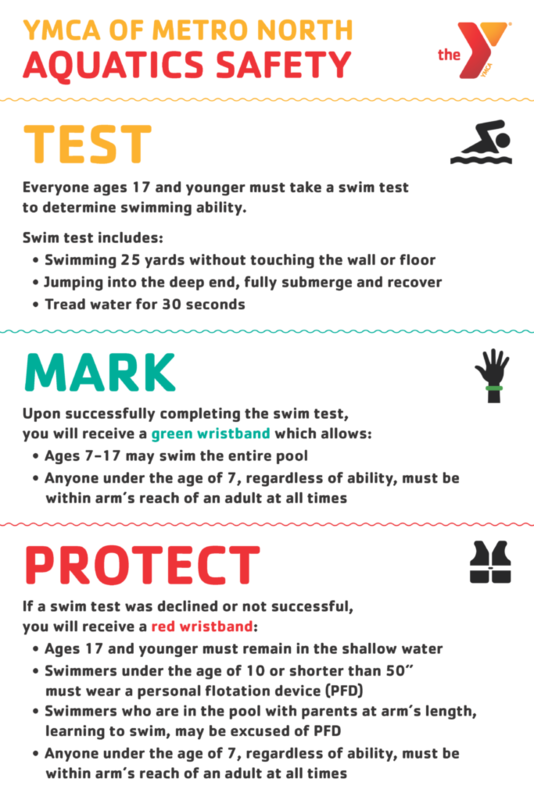 FREE swim evaluations for the new levels are available to help place your child in the appropriate level. For more information on class levels and to contact your Aquatics Director please visit here. Parent/Child A: (6 months – 18 months) Parents learn water safety, holds and towing techniques that encourage basic kicking/pulling and water independence for children. Swim diaper must be worn. Parent/Child B: (19 months – 36 months w/ parent) Toddlers are introduced to submerging, kicking and pulling combinations, floating and swimming without flotation. Swim diaper must be worn for children not potty trained. Level 1: This class is for the child who has little or no experience. Increases comfort with underwater exploration and introduces basic self-rescue skills performed with assistance. Please bring goggles to class. Level 2: Swimmers must swim 5 feet without assistance or flotation and fully submerge their face in the water to enter this class. Encourages forward movement in water and basic self-rescue skills performed independently. Please bring goggles to class. Level 3: Swimmers must swim 20 feet or about three quarters the width of the pool without flotation to enter this class. Develops intermediate self-rescue skills performed at longer distances than in previous stages. This class will be taught in the deep end of the pool. Please bring goggles to class. Level 4: Swimmers must be able to proficiently swim the width of the pool on their stomach and back without flotation to enter this class. Introduces basic stroke technique in front crawl and back crawl and reinforces water safety through treading water and elementary backstroke. This class will be taught in the deep end of the pool. Please bring goggles to class. Level 1/2: This class is for the child who has little or no experience. Increases comfort with underwater exploration and introduces basic self-rescue skills performed with assistance. Please bring goggles to class. Swimmers must be able to swim the entire length of the pool with proficient front crawl and backstroke and tread water for 1 minute to enter this class. Swimmers are introduced to the four competitive swimming strokes as well as rescue skills and healthy lifestyle habits. Level 6: Swimmers must be able to swim 200 yards continuously with proficient front crawl and backstroke with rudimentary breast stroke, butterfly and tread water for 2 minutes to enter this class. Please bring goggles to class. Adult Beginner Swim: This is the place to start for adults who don’t have a lot of prior swimming experience. Participants will become more confident in the water and will learn the fundamentals of swimming and aquatic safety. Adult Stroke Development: Develop basic swim strokes and use swimming as a source of fitness. It is recommended that participants have taken beginner swim lessons before enrolling in stroke development. Swim Fit (Master’s Swim): This program provides workouts for triathletes and fitness swimmers. This class will aim to meet everyone’s needs. All levels encouraged to participate. Classes are 30 minutes in length for both private and semi-private lessons. Private lessons are available to both children and adults of all skill levels. Semi-private lessons are available to up to 3 children in a group with similar swimming ability. Private Swim Lessons are only available for YMCA of Metro North Members. After a request is submitted, the branch aquatics/assistant aquatics director will follow-up by email or phone. Learn to Dive: (age 6+) Learn to dive in head first and progress to diving off the starting block to the diving board! Participants must be able to swim the length of the pool without aide. Springboard Diving: (age 7+) Learn the basics of competitive diving. Students will practice approaches forward and back jumps in straight, pike and tuck body positions, and forward and back dives. Participants must be able to pass the deep water test and do a forward dive from the side of the pool. Advanced Springboard Diving: (age 11+) This class is for divers who have been promoted from the beginner class or high school divers who want to perfect their advanced skills. Instructor recommendation is required. Babysitting and Junior Lifeguard Program: (ages 11-14) Topics for this combo class will cover first aid, choking, CPR, medical emergencies, diapering, spoon feeding, water safety and more! Digital certification available upon completion of course for both babysitting and junior lifeguarding. Participants must be able to swim 100 yards (4 lengths of the pool) to be eligible for the junior lifeguard component. Lifeguard Bootcamp: (age 15+) This 7 week course will build up your stamina to swim 500 yards, retrieve items from the bottom of the pool, and build your strength for you to assist any size victim. Class format will be both dry land and aquatic training. Minimum requirements for class must be able to swim 25 yards and lift a minimum of 25 lbs. Lifeguard Training: (age 15+) Students will be trained in the nationally recognized American Red Cross Lifeguard Course including CPR, First Aid, 02 and AED. Certification is determined by successful completion of a comprehensive written exam and water test. Swimming skills are a pre-requisite and attendance in all classes is mandatory. Red Cross Lifeguard Re-Certification: (age 15+) This is a 4 hour review and testing to re-certify for American Red Cross Lifeguard, CPR/FA/AED and Optional Oxygen. Students should come to the review prepared and ready to show their skills. Certification must be current. Prior to taking this re-certification, please take the online refresher course found at www.redcrossrefresher.com. Refresher courses for both lifeguarding and CPR/AED for professional rescuers should be completed. Discover Scuba: (age 8 – age 80) Class begins with a brief top side lesson followed by getting in the pool with an experienced instructor. All equipment is provided. Open Water PADI Certification: (ages 10+) This class will include your entire certification and equipment for pool and open water test. Rental of wet suits available but not needed for pool time. The classroom book needed is “Open Water Diver Manual” and may be purchased individually or from the instructor the first night for an additional $55. *Classes vary by branch, please contact your branch Welcome Center for class details and availability. The PLYP Piranhas Swim Team is for children and teens between the ages of 6-18 years old. The team is designed to physically condition young swimmers and work towards perfecting competitive swimming skills. The season consists of competitions against other Y swim teams in our division as well as a variety of invitational and championship teams. The summer session begins in April and ends in July. The Piranhas Swim Team is organized in multiple categories to allow swimmers to practice at levels congruent with their age, physical and technical abilities. Try outs will be held in order to place each swimmer into an appropriate level. If you are 8 and under, you must be able to swim 25 yards (1 length) of both backstroke and freestyle and show motivation to learn more about the strokes. If you are 9 and over, you must be able to swim 50 yards (2 lengths) of both backstroke and freestyle and show motivation to learn more about the strokes. All swimmers must be a YMCA of Metro North member. Spots are still available, inquire today! For more information please contact Jose Medina at jmedina@metronorthymca.org or visit the team website here. The Melrose YMCA Sharks Swim Team is a competitive YMCA and USA swim team for children ages 6-18. The Sharks participate in YMCA Swimming as the Melrose YMCA Sharks (MELY). As members of the Eastern MA YMCA Swim League we compete in Division 1 Dual Meets, YMCA Invitational Meets in Massachusetts, New Hampshire and Connecticut, Eastern MA YMCA Swim League Districts, YMCA New England Championships and YMCA National Championships. The Sharks have 6 dedicated coaches who will work with swimmers to bring out the best in their ability to achieve the highest level of competition they can. The team is comprised of over 100 Sharks who participate in two seasons – SCY (Short Course Yards) beginning in September and LCM (Long Course Meter) beginning in May. We refer to these as Fall/Winter and Spring/Summer. Try-outs are held at the beginning of the season for new Sharks. Returning Sharks from the previous season must place their deposits before try-outs to retain their spot on the roster. Swimmers new to the Melrose area after scheduled try-outs should call the Aquatics Director at the Melrose YMCA at 781-665-4360 to check for availability on the roster and arrange a try-out. Our practice squads are adjusted seasonally to best suit the needs of the current swimmers, but generally fall into four groups – Freshman, Sophomores, Juniors and Seniors. We do not place our swimmers in groups by age, but by ability. For more information please contact the Melrose Family YMCA Welcome Center at 781-665-4360 or visit the Sharks Swim Team website. The Lynn swim team is a competitive environment for swimmers looking to continue building their swimming skills in a team format. The team focuses on stroke development, technique, and racing starts/turns. Prerequisite: Swimmers must be able to demonstrate strength in swimming. They should be able to swim at least 2 lengths of the pool and have knowledge of all 4 strokes to qualify. For more information please contact the Lynn YMCA Welcome Center at 781-581-3105. We take pool safety seriously and work hard every day to provide a safe and enjoyable experience to all of our members. Please take a moment to fill out our brief Aquatics Safety Survey.